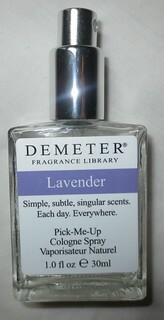 I own a few different fragrances from Demeter, but lately I've been gravitating towards their Lavender* scent ($20 CAD). These Pick-Me-Up Cologne Sprays can either be used as a perfume or as a room spray (which is how I like to use them). What I love most about Demeter's fragrances is that they always smell exactly like what they're supposed to. These single-note fragrances do an excellent job at capturing that specific scent, and evoking memories associated with that scent. I normally don't gravitate towards Lavender or heavy floral scents, but I do really like this one. Lavender is quite calming, so I like to spray a few spritz' of this fragrance around my room before I go to sleep. I am obsessed with lavender. I have a lavender oil roll on ... I totally roll it under my nose every night for sweet dreams ... it also helps with stress! Are there any places in Ottawa that sell them that you know of? Or did you order from them online? :O!!!!!!!! That is so awesome!!! :D Thank you! No problem! :) Do you know what scent you wanted to try?